Pwint is our Destination Expert in Myanmar. "3 different guides and drivers. All excellent. 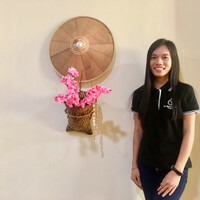 Guides speak English very well and had an excellent k...". "Theo tour was excellent prepared by The Mighty Myanmar Travel and completed by our guide Pai. Always...". Explore the culture and nature of Myanmar with this extension of the classic tour offering you the opportunity to discover more of this country's well-kept secrets! Arrive at the Royal Mandalay and immerse yourself into Myanmar's historical sites that include visits to the ancient cities of Amarapura, Ava, and Sagaing. You'll eventually find yourself looking up at the largest standing Buddha in Southeast Asia located at Monywa. Escape from the big cities to experience the nature and culture of the Palaung tribe in Kalaw. If you are keen on photography, do not miss Pindaya and the spectacular Inle Lake. Your last stop will be Yangon, the big city of Myanmar. Departing from this garden is one of the best ways to save time and money. Experience culture, nature, adventure and trekking, in this beautiful land within in 12 days! Any personal expenses for souvenirs, lunch, dinner, tips, etc. Upon arrival at Mandalay International Airport, you'll witness the pagoda-style construction of this modern building. 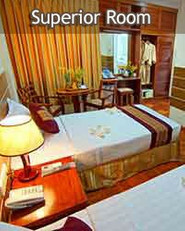 Our guide will personally meet you and take you to your hotel in Mandalay City. After checking in, you'll have the entire day to explore the last royal capital of Myanmar freely. Today, you'll sightsee in Mandalay and learn about its rich history. You'll visit the Mahamuni Pagoda, an important Buddhist pilgrimage site, which features a four-meter-high image cast in bronze but now resides under a thick layer of gold leaf. The six bronze Khmer figures in the courtyard originate from Angkor Wat, Cambodia, from where they were brought back by Mrauk. Take a moment to reflect at the 1895 Shwe Inbin Monastery which displays exquisite wooden carvings in its balustrades and roof cornices. Shwe Nandaw Monastery, or the “Golden Palace Monastery,” is a reminder of the old Mandalay Fort. Finally, you'll end your day on Mandalay Hill where you can appreciate a magnificent sunset from the hill top pagoda. Tired? You will be driven back to your hotel for your overnight stay. 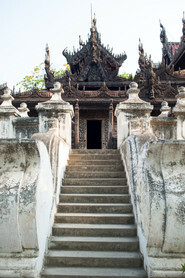 Today, you'll embark on a full day excursion to ancient capitals, surrounding Mandalay. Your first stop is Mahagandayon Monastery, the country’s largest monastery home to thousand monks. Here, you'll learn traditional silk weaving at a workshop. Next, you'll board a ferry for a short river crossing to a waiting horse and carriage. You'll travel to Ava, capital between the 14th and 18th centuries, to find centuries old wooden Bagaya Monastery and remains of the Royal Palace and Fort. Cross Irrawaddy River and continue to Sagaing Hills - home to 3,000 monks, 100 meditation centers, and is considered to be Myanmar’s religious center. Visit Soon U Ponya Shin, Umin Thonezeh, and Kaung Hmu Daw Pagodas. Finally, you'll return to Amarapura for a sunset over the 200-year-old U Bein Bridge, the world’s longest teakwood bridge. Today, you'll take a 3-hour journey to Monywa, a city in central Myanmar. Monywa, a charming metropolis situated on the eastern bank of the Chindwin River is a major port of trade for agricultural products from the surrounding Chindwin Valley. You will be taken to the magnificent Thanboddhay Pagoda Complex, that is a keeper to 7,350 statues and almost 600,000 sacred images of the Buddha, including the world’s tallest standing Buddha. This colossal figure measures approximately 130 meters in height and is hollow inside. From Monywa, travel for two hours towards the awe-inspiring sandstone caves of Phowintaung. If time permits, you are free to visit the caves either today or tomorrow. Get some sleep at your accommodations in Monywa to prepare for tomorrow! Didn't get enough of Monywa yesterday? Well, today you are free to visit the caves of Phowintaung. Afterward, you will start your four-hour drive to Pakkoku, situated alongside the magnificent Irrawaddy River. Pakkoku is best known for Burmese Tobacco and lively Thanakha trading. Explore the Thanakha market and try your hand at a slipper making workshop in town. Later, you will drive to the Pakokku Jetty and board a private boat to Bagan. During the two hour journey, take in the scenic view of the charming rural villages along the river’s bank, and see where the Irrawaddy and the Chindwin Rivers meet. 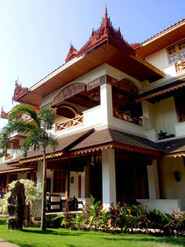 Upon arrival at Bagan, you are escorted to your hotel and are free to enjoy the rest of the day. Enjoy a day of sightseeing in the ancient city, Bagan, the capital of Myanmar from the 11th to 13th centuries. Bagan is home to over 2,000 temples and pagodas and is one of the most remarkable archaeological sites in Asia. Enjoy the authentically, colorful Nyaung U Market then proceed to Shwezigone Pagoda, whose graceful bell shape became the prototype for Myanmar’s pagodas. Visit a series of astonishing temples including Kyanzittha Umin, Gu-Byauk-Gyi, Ananda, Thatbyinnyu, and the renowned Htilo-Minlo Temple which features murals, original fine plaster carvings and sandstone decorations. After lunch, rest up before your tour of Dhammayangyi Pahto and Sulamuni Pahto, an example of the finest architecture of the12th century temple styles. Partake in traditional lacquer-ware workshops in Myinkaba village then end the day at Pyatthatgyi Paya or atop one of Bagan’s temples. After an early breakfast, your driver will take you to the airport where you catch your flight to Heho. 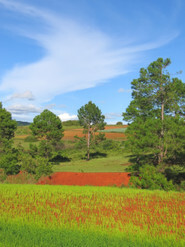 Upon landing, you will be chauffeured to Kalaw via Pindaya - enjoy a beautiful pastoral scene along the way. The Pindaya Caves are a sacred cave complex that features over 8,000 Buddha images made from alabaster, teak, marble, brick, lacquer, and cement. You'll get a detailed look at the making of the famous Shan paper and beautiful Burmese umbrellas at a local umbrella factory. Next, is a one-hour scenic drive to Kalaw, a former British hill station and one of the most popular towns to trek to on the western edge of the Shan plateau. Get lost in the Kalaw Market, where you can people watch the hill tribe inhabitants and other residents of Kalaw - Nepali, Indians, Gurkhas, Bamar, and Shan. Finally, end the night at your hotel in Kalaw. After a delicious breakfast, you will be driven to start a hike to Pane Ne Pin. The road and trails wind through gorgeous, lush scenery and after one and a half hours, you'll arrive at the Palaung Tribal Village of Pane Ne Pin. There, you'll meet the villagers and learn about how they earn a living from farming and hunting. In addition, you'll learn about how they live in long houses, usually shared amongst 4-5 families. Next, you'll sit down and share a meal at Pane Ne Pin, before another ½ hour trek to the View Point where you can take in a stunning, panoramic view of Kalaw. After today’s adventure, you'll return back to Pane Ne Pin and continue for a ½ hour to your waiting car which will drive you back to Kalaw for your overnight stay. After breakfast, you’ll drive towards Nyaung Shwe at the Inle Lake. Along the way, you’ll visit the picturesque 19th Century Shwe Yan Pyay – which features ornate oval windows, mosaics, and artwork crafted in gold. Next, board your private boat for a full day of sightseeing of Myanmar’s most spectacular natural sights on the lake that's surrounded by high plateaus and the misty Shan mountains. You can observe the unique one-leg rowing of Intha People who live in bamboo stilt houses in the waters. Your first stop is the holy Phaung Daw Oo Pagoda, the holiest religious site in the southern area of the Shan State. You are invited to participate in traditional workshops around Inle Lake including goldsmithing at Ywama Village, silk and cotton weaving at In Paw Khone village, boat and Burmese cheroot making factory at Nam Pan Village. Finally, spend the night at your hotel on Inle Lake. Today, off to the Five-Day-Market! These bustling markets around Inle Lake offer a variety of local produce mainly grown on floating gardens. The markets rotate between villages over the course of five days. You will be boated from the center of the lake to a small canal leading to Pa-oh village of Indein. Located on the western shores of the lake, Indien invites curious visitors to see the 1,094 stupas surrounding the Indein Pagoda. This pagoda is the original home of the five famous Buddha images of Inle Lake. Find your adventure on foot around the village visiting the local school and ancient pagodas. Finally, we will visit Kaung Daing Village, to munch on the village’s famed rice crackers, tofu snacks, and fried beans. A 40-minute walk leads you to the local hot springs which attracts locals and tourists alike. Next, you'll go back to your hotel where you can spend the day as you like. See The Best Sights Of Yangon! Pack your bags for a flight from Heho Airport to Yangon! Your guide will pick you up at the airport and take you on a tour of the city. Welcome to Yangon (Rangoon), the former capital of Myanmar and presents a lush impression of verdant trees, above which shimmering pagodas seem to float. Yangon retains majestic old buildings testament to its colonial past. Next, view the Chaukhtatgyi Reclining Buddha situated a stone’s throw away from the Shwedagon Pagoda. The highlight of your trip to Yangon, and indeed Myanmar, will be the 2,600-year-old gilded pagoda, found between the People’s Park and the Kandawgyi Lake, and appears most beautiful during the early morning or evening. After a delicious breakfast, you can spend your free time relaxing and recovering from you many Myanmar adventures over the past few days! At the appropriate time, you will be transferred to Yangon International Airport for your flight back home or to continue your travels!